"Music's the medicine of the mind". We provide complete piano refinishing and restoration services. A careful and thorough restoration to its original sound and beauty will significantly increase the value of an antique piano by multiple times the unrestored value. 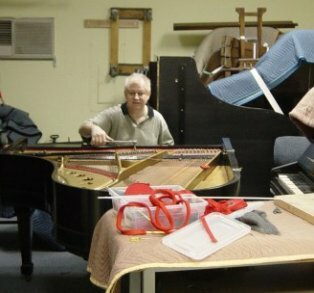 Plano Pianos provides a full range of piano restoration and piano rebuilding services and can develop a restoration plan tailored to your budget to get the most from your piano. We only use the finest parts when restoring pianos to ensure reliability and authenticity. We take delight in returning your antique piano back to its original beautiful condition. If you are interested in having your piano restored, please click here.